To misquote Churchill: "GNU Autoconf is the worst cross-platform porting solution except all the others that have been tried." While its combination of M4 macros and 'portable shell' isn't pretty, Autoconf is the industry standard for writing portable code. My contribution is a set of macros to check for omniORB. 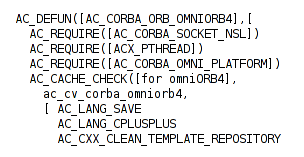 Here's the macro that checks for omniORB4: AC_CORBA_ORB_OMNIORB4.m4 [full index]. The macro searches for the omniORB4 libraries and then tries to link a trivial program against them.